We all know that when kids (and wives/GF's) get cold hands that the excursion is pretty much over. I came up with this concept from how the Kelly Kettle works. Since diesel has the best BTU per weight I went with it. That and because I wanted to just for the heck of it, I like the smell. It's machined from 7075 aircraft aluminum which is strong and very corrosion resistant. The cap reservoir holds about 1 1/2 teaspoons of diesel but alcohol and kerosene will also work. 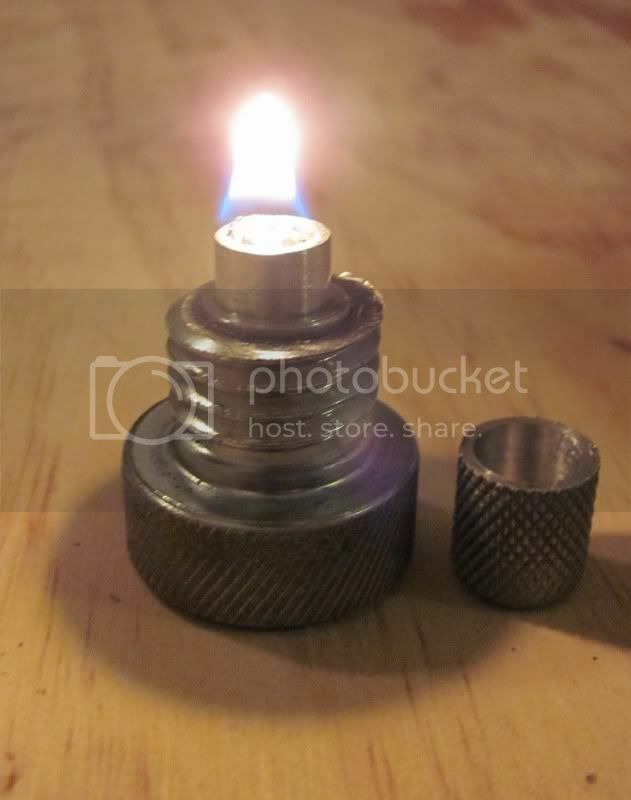 The wick is 1/4" and the holder pops out to refill it. The small cap keeps it from leaking and evaporating. The reservoir is larger in the cap area. I have a special boring bar that can do that. It can hold a very small flame which is adequate for the heat to flow up the four chimneys. The flame is only half the size then the pics shows. Our dig cams pick as much infrared as visible light. The center is filled with a bismuth alloy core to sink up some of the heat. Then hold it to convect warmth back into the warmer after the flame is out. It's heavier then lead so it can hold a lot of heat. It's plugged with copper since copper conducts heat very well. 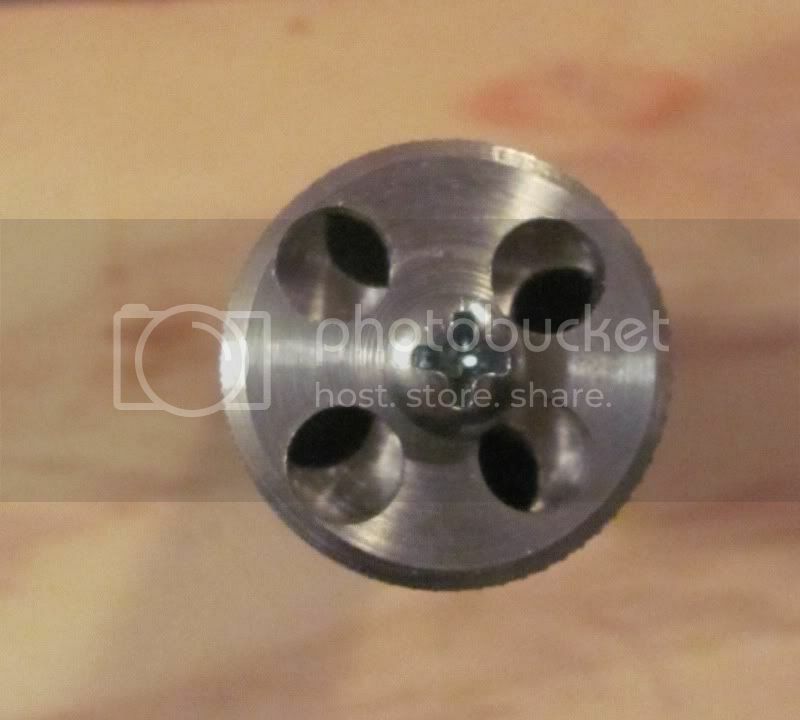 It has four 1/4" holes bored through from the bottom to the top. These allow the chimney effect and an even heat exchange. My wife is going to make a fleece sleeve for it to help moderate the heat. It's 5" high and 1" diameter. The vent holes are 1/8" dia. to shield it from the wind and it can be re-lite through them if the wick is warm. After some use I may have to modify the holes some to get a good balance of air flow and wind protection. On the top I machined a chimney choke to also moderate the heat. It can rotate around to full open or all the way closed. I'm sure after it goes out on a snowshoe trip there will be some fine tuning needed to optimize it. I will update any mods I make to it. This system will be cheaper, faster and warmer then the chemical hand warmers. Although it's not made to go into pockets unless the flame is out. Feel free to copy this or share it with others. All you need to build one is a drill press, 3/4 and 10-24 taps, 5/8 drill bit and a 3/4" by 2" bolt. 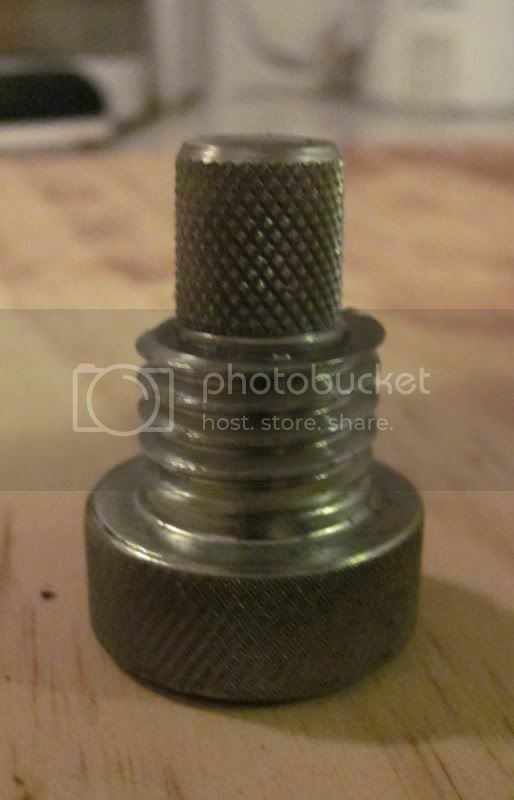 I used the metal lathe to bore out the bottom and put the knurling on the choke and burner cap. It's not needed. The trick to making the holes align on the choke is to drill the four holes and the machine screw hole into the alum bar. Then cut off a 3/16" slice from the end. re-attach it with a 10-24 or 8-32 stove bolt after cleaning up the two sides of the cut. They have to rotate fairly easy. How long will it burn? (didn't see it in the text). I just finished it last night so I have not tested the burn time. It does warm up fast though so it won't require much burn time. Unless I use in it Siberia in the dead of winter. Bfinnigan wrote: I just finished it last night so I have not tested the burn time. It does warm up fast though so it won't require much burn time. Unless I use in it Siberia in the dead of winter. Great idea. Will it burn up side down? Laying flat? Does it fill quickly? 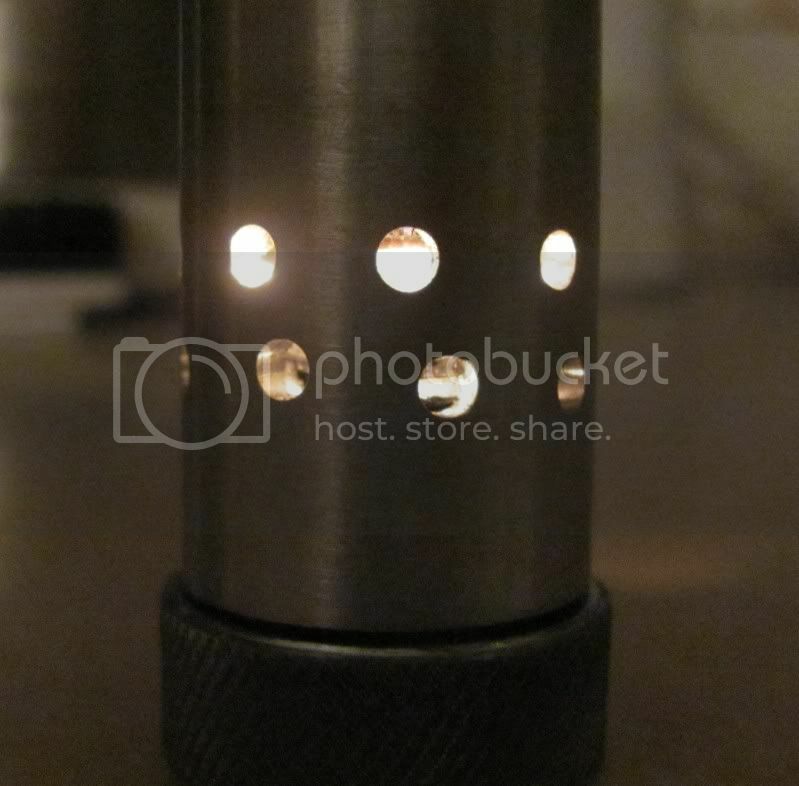 Oops56 introduced us to some ceramic burners that use wicks to draw up lamp oil. Anyone remember those things? I think they glowed rather than a flame???? How about a stove pipe end cap filled with alcohol/kerosene and laid flat on the ice. That and because I wanted to just for the heck of it, I like the smell. .you like the smell..............really??????? or you pullin my leg? I used to be a firefighter/EMT and all the engines ran on diesel so it brings back some good memories. It's the smell of work, liquid or combusted. It burns almost horizontal but not completely flat. The flame ice fishing auger sounds like a cool idea. Good thing I don't know any ice fisherman. I had to drill a few more air intake holes but it's fired up and working great. One more mod and it should be field ready, just have to wait for the aluminum. I can see possibly building a set of treking poles with built in kero or diesel hand warmers for the grips. It's that dual use concept I like so much. To me UL incorporates multi function along with lighter weight. That is an awesome idea Is the inside of the tube getting lots of carbon/soot buildup? Will paper catch on fire if held 1/4" from the air intake holes?